In 1908, Stathcona School was built at the north east corner of St. John’s Road and Runnymede to relieve pressure on surrounding schools. The school was named after Donald Smith, Lord Strathcona. He had driven the last spike of the Canadian Pacific Railway. 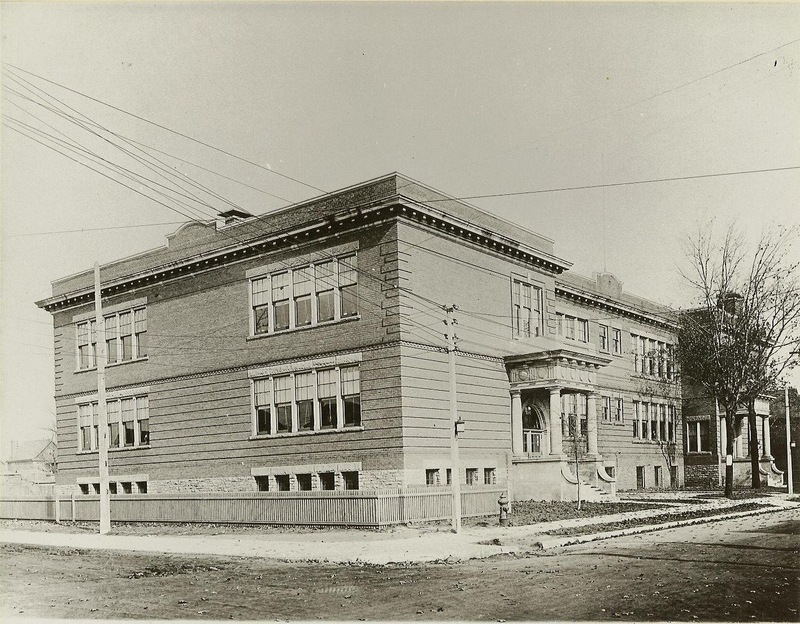 The new school was opened in 1909 by the West Toronto Public School board and was taken over later that year by the Toronto Board of Education. By 1910 the school employed eight teachers and consisted of eight rooms. It was enlarged in 1913. By 1937, the average enrolment was 501 pupils. In 1941, there was a proposal to close the school and in 1943 it was indeed closed. In 1945 it was officially reopened as Runnymede Chronic Care Hospital. In 2011 the original building was demolished and the new hospital was built. A robust classicism adapted to the modern school. Modern approach to fenestration for the classroom, giving plenty of natural daylight. Strong horizontal banding of first floor alludes to ashlar stone coursing. Roman doric columns support clasically decorated entablature porches at the two main entrances, typically one for boys, the other for girls. This decoration is reminiscent of the original porch of the Masonic Temple and similar to the porch at the Annette Street Public School. The main entrances are located at the vertical mid-point between the basement and the first floor. The high basement allows for usable teaching spaces (such as gymnasia) as well as service spaces. The overall massing of the building reveals the internal organization: a capital letter “I” in plan, where the top and bottom cross stokes each contain 2 classrooms opening off of an internal hall, which links to a central corridor through the centre of the floor plan, itself being 2 classrooms on each side of the central corridor. Total classrooms are 8 per floor. Vertical circulation likely also takes place just inside of the main doors. Original building was likely only the central portion, as this would account for the original 8 classrooms. When the building was expanded by adding the 2 wings, the additions forced the relocation of the entrances.